If you’re in the market for the best car seat for your upcoming addition to the family or a next-step for your soon-to-be toddler, the number of products available on the market is overwhelming to say the least. A new infant car seat is your first introduction to all the safety measures you need to consider as a parent. After all, you have to get your bundle of joy home from the hospital, and that in itself can be a nerve-wracking experience. We’re here to help relieve some of that stress by giving you our recommendations for what to look for in a car seat, from the features, safety factors, car seat guidelines and more. What are the Best Car Seats? Wanting to jump straight into the reviews? We considered a number of factors when choosing our best car seats. Safety comes first, without a doubt, but we also looked at ease of installation and use, features, cost and consumer reviews. See our top picks and our pros and cons for each of our winners. What are the types of car seats? Infant seats are rear facing and generally have a weight limit of 22 pounds, although a number of newer models go up to 35 pounds. The best feature of infant car seats is their portability – you can detach the car seat from a base in your vehicle and take your infant with you, ideally while he or she is still sleeping. Many infant car seats will also attach directly to a stroller. Convertible seats are the most popular, because they adapt to different heights and weights. You can use most convertible car seats as rear facing at first (the American Academy of Pediatrics now recommends rear facing seats until the age of two) and then switch to forward facing once your child is large enough. Depending on your child’s growth, you might be able to use this type of seat for several years, saving you money and the hassle of searching for a new product. Booster seats are for children ages 4 and older who weigh at least 40 pounds. Generally they are lightweight, high-back seats that are used with your backseat seat belts. The National Highway Traffic Safety Administration (NHTSA) recommends children stay in booster seats until they are at least 8 years old and 4 feet 9 inches tall. All 50 states and the District of Columbia have mandatory child carseat laws but they differ by state. Check the laws in your state or visit the Insurance Institute for Highway Safety (IIHS) website, which has a comprehensive list of laws for each state. All seats rated by NHTSA have passed Federal Safety Standards and strict crash performance standards. Our top picks for best infant car seat adhere to Federal Safety regulations and have undergone rigorous crash testing. Coming in as our best pick for your infant’s car seat is the rear-facing Chicco Keyfit 30 Infant Carseat. Like Britax, Chicco has been a top manufacturer for a number of years, and they’re well-known for their quality and safety. The Chicco Keyfit is an excellent choice for smaller babies and preemies, but it also is a safe choice for babies up to 30 pounds. Our runner up for best infant car seat is the rear-facing Graco Snugride Click Connect 35. Graco is one of the best-known and most popular manufacturers of all types of baby equipment for their high quality and affordable prices. The Snugride is a great choice for parents for its ease of use without the sacrifice of safety – it’s lightweight and clicks into the base or stroller incredibly easily. The Snugride is listed among the top choices by many consumer reports and publications. It doesn’t take long for children to outgrow their infant seats. 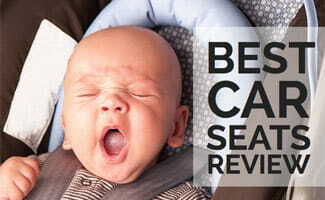 Here are our choices for the best toddler car seats. Another Britax model makes our number one choice for Best Toddler Car Seat. The Britax Marathon G4.1 Convertible Car Seat is our top choice for its safety, comfort and impressive number of features offered. Although it’s on the pricey side, we love that it has steel bars to brace the frame from impact. And you can use this as a rear facing infant seat all the way up to a forward-facing seat up to 65 pounds. A top-seller for its attractive price tag and safety features, the Graco Nautilus 3-in-1 is our number two pick for best toddler car seat. Unlike our Britax Marathon top choice, the Graco Nautilus is only forward facing, so you can’t use it as an infant seat. But the great thing about the Nautilus is you can keep your child in this car seat up to 100 pounds, converting it to a booster as your child gets older. The Evenflo Symphony Convertible Car Seat rounds out our top three picks for best toddler car seat. An affordable price, great features and good safety measures make this a great choice for families on a budget who don’t want to sacrifice safety. And you can use this car seat as a rear-facing infant seat as well as a forward-facing toddler seat up to 110 pounds. Fortunately for parents, booster seats are less involved when it comes to all the safety measures, features, installation, portability issues and expense you’ve had to incur with your child’s previous vehicle seat(s). And finding the best booster seat is a relatively easy process – the main things to look for are proper and safe seat belting and comfort for your child, who’s definitely old enough to voice an opinion on the matter. Here are our three recommendations for a best booster seat. Be sure to read your manual carefully to know how to correctly install your new safety seat. Some experts recommend installing your car seat in the middle of the back seat, but many cars are uneven, too narrow or aren’t well-equipped with middle seat belts or anchors. The safest place is where you can install your new car seat as tightly as possible using either your car’s seat belts or LATCH system. What is LATCH all about? LATCH, which stands for Lower Anchors and Tethers for Children, is a safety system required in most cars and car seats since 2002. LATCH essentially consists of a set of lower tether straps and upper tether straps located on the bottom of the car seat. You connect these tethers to built-in anchors located in your car. With LATCH in place, you don’t use your car’s seat belts on your baby’s car seat. Be sure to read your vehicle’s owner’s manual to know where all the anchors are located – they differ by make and model. Some experts recommend removing the lower tether anchors when the total weight of your child and his or her car seat exceeds 65 pounds. The American Academy of Pediatrics suggests following these guidelines, but to be sure to read your manual for its specific weight limits. Watch this NHTSA video for tips to get you started on installation. For added safety and peace of mind you can find a certified carseat safety inspection center, where a technician can make sure you have installed everything correctly. Buying the best car seat is one of the most important first decisions you’ll make as a parent, and there’s a lot to know. Use our best car seat reviews, installation information and tips below to help you make the best choice for your family. Avoid buying used car seats, particularly if you don’t know the car seat’s history. Don’t use seats that have been involved in an accident. Seats can get easily damaged in an accident (even if you can’t see any damage) and should be replaced. Be sure to check for the latest recalls. Periodically do a safety check to make sure your car seat is still secured as tightly as possible. Happy with your car seat? Or do you have warnings for other parents?